The 36th annual Toronto International Film Festival (TIFF) was held in Toronto, Ontario, Canada between September 8 and September 18, 2011.Buenos Aires, Argentina was selected to be showcased for the 2011 City to City programme. The opening film was From the Sky Down, a documentary film about the band U2, directed by Davis Guggenheim. Considerable media attention at the time focused on Madonna's behaviour during the festival. The TIFF Bell Lightbox had its formal opening on September 12, 2010, during the 2010 festival. This shot was taken the day before the opening. Fable of the Fish by Adolfo Alix, Jr.
Swirl by Helvécio Marins Jr.
^ "TIFF 2011 announces closing night film and final lineup of Galas and Special Presentations". Archived from the original on March 29, 2013. Retrieved October 19, 2013. ^ "TIFF List 2011: A Complete Guide To The Toronto International Film Festival". Retrieved October 19, 2013. 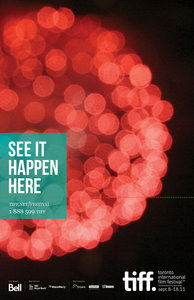 ^ "2011 Toronto International Film Festival Annual report" (PDF). Archived from the original (PDF) on June 17, 2012. Retrieved October 11, 2013. ^ "The Festival" (Press release). 2011-03-01. Retrieved 2011-03-01. ^ "Toronto International Film Festival Selects Buenos Aires As 2011 City To City Selection" (Press release). 2011-02-08. Archived from the original on 2011-03-12. Retrieved 2011-03-01. ^ "U2 documentary to open Toronto Film Festival". BBC News. 2011-07-27. Archived from the original on 28 July 2011. Retrieved 2011-07-28. ^ "TIFF: Awards 2011". tiff.net. Archived from the original on 2011-09-23. Retrieved 2011-09-28. Wikimedia Commons has media related to 2011 Toronto International Film Festival.